Okay, I just wanted an excuse to post this picture. I thought it was sort of funny in a weird way… or weird in a sort of funny way! Given my dad's interest and positive talk about Canada especially in the last few years since he started consulting for several firms there, I thought I'd broaden my horizons and subscribe to the primary CBC News RSS feeds in Google Reader, and @CBCNews on Twitter. Canada and Australia have a heck of a lot more in common than I could have imaged. Both were former British colonies. We both peacefully federated/confederated from Britain. We have Queen Elizabeth as our head of state, represented by a Governor General. We have her mugshot on the observe side of all our coins. We call them solicitors not attorneys. Our landmasses are huge, and close to another member of the Anglosphere. We use "dollars". We're in the Commonwealth and compete in those Commonwealth Games things. The makeup and structure of our economies and our exports are scarily similar. We have "lively parliaments" with question times and verbal jousting. We use SI units of measurement (mostly!). We have Prime Ministers. We have states with elected Premiers and royally appointed and largely useless Governors. Our judges and barristers wear those ridiculous woolen wigs. We have indigenous brothers and sisters who are fighting for recognition and dignity. Our names have three "A" letters in them. We both have similar hearty, self depreciating senses of humour :). That's not to say we don't have our differences. For one thing Canada is somewhat colder than Australia and has somewhat different landscapes (no, really?!). 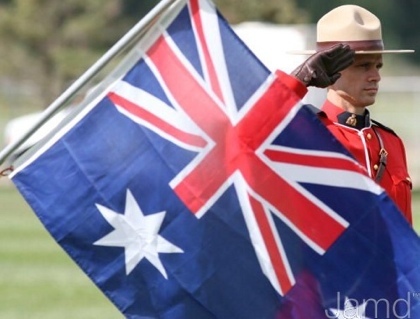 Canada has upwards of 30 million people when Australia has upwards of 20 million. Australians aren't so good at hockey, Canadians aren't so good at cricket. Australian's drive on the proper side of the road, Canadians drive on the incorrect side of the road. A large minority of Australians can't speak French. Canada doesn't have cuddly marsupials and monotremes. Australia no longer has an incompetent, unpopular Prime Minister who has lost the confidence of Parliament and his or her people. Ooh, I can see the topic for another post surfacing! Update: done! Some day I'd love to travel to Canada, detouring of course to visit Alaska first. Something tells me I'll need much more winter clothing and gear… and a lot more money!